Here's a free pattern for you — an extract from The Odd Ball Knit Book. Made all in garter st (knit every row), this is a good project for a beginner, providing it’s not made too long. If a long scarf is what you want and there is not enough room on one needle for all the stitches then either use a circular needle used as a pair (turn at the end of the row) or two pairs of needles (when you run out of space for more stitches on your needle, just keep them on by winding a rubber band around the tip of the needle, then carry on with another needle for the rest of the stitches). The scarf is made sideways, i.e. with stripes running the length of the scarf and fringes matching the stripes. Size is up to you: a good warm winter scarf can be 2 metres or more long, depending on how many times you want to wrap it around your neck, and if you want it to trail the ground in Dr Who style. A medium length warm scarf is good at around 1.75 m. Smaller tuck-in-the-collar scarves can be 1m only. Use a measuring tape as a scarf to see what you need. Fringes save having to weave in ends of yarns and look decorative as well. As a guide, a small narrow scarf takes 50-75 gm. Medium length and width scarf takes 100-200 gm, and a Dr Who scarf could take as much as 400gm depending on width. Fringes take a lot of yarn as well; it can be as much as 50gm for a thick fringe. A long pair of needles for a short scarf; two pairs of needles and two rubber bands or a long circular needle for a long scarf. Firstly make a sample piece and calculate how many sts you will need. Briefly, the sample piece is used to work out how many sts you will need (there is a more detailed section on this in the book). Cast on approx 40sts using needles you think will be suitable. 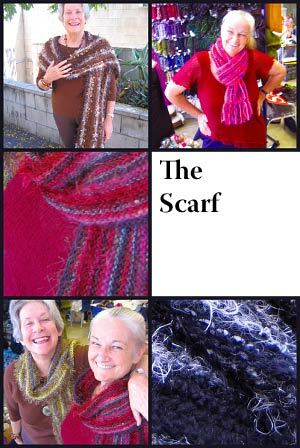 You will probably want to use quite large needles to make the scarf soft and "flowing". Work garter st (knit every row) for at least 10 cms, or until all the different yarns you are going to use have been knitted; as a representative sample of what you will use in the scarf. When you have finished the sample you are happy with, you don’t need to cast off — just take the work off the needle. Find the row of yarn that looks an average width to you, not the thickest or thinnest, but in between, over a row of average thickness yarn. Place safety pins between the sts, at the point two sts from the edge, on both sides of this row. Count the number of sts between the pins (36 if you started with 40). Now, holding it up by one end, so it stretches, as a scarf will when worn, measure the length between the pins in cms, to the nearest quarter of a cm. Using a calculator, divide the number of sts by the number of cms just measured: this gives you how many sts per cm average, for your collection of yarns on your chosen needles. Multiply this number by the length in cms you want your scarf to be (without fringe) — this will give you how many sts to cast on. Leaving a 15 cm "tail", cast on required number of sts using cable method (after making 2 sts, place right needle between the last 2 sts to make the next st). Before knitting the first row, measure out 30 cm yarn from end of cast on row, fold in half and make a simple round knot as close as possible to the start of the row. The loop will be cut later and become part of the fringe. Knit 1 row, turn and repeat the doubled 15cm knotted yarn for fringe at the other end of the scarf. Knit second row. You will probably want to change colour now (or after 2 more rows): cut off last yarn leaving 15cms end, measure 15cms new yarn and knot with old end of yarn close to sts, knit 2 rows, remembering to knot yarn for fringe at the ends of the first row again. Knit in stripes until scarf is required width, knotting yarn for fringes at the end of every row, whether changing colours or not. Cast off knitwise, using a 2or 3 sizes larger needle to stop the edge gathering. Break off yarn leaving a 15 cm "tail" again to be incorporated into the fringe. When the scarf is finished, lay it flat with the doubled, knotted, fringe ends over the edge of a table. Place a waste basket underneath, and cut the ends to a uniform length. Knot the tips of any yarns which are likely to fray.